Joshua's class went on a wonderful field trip this week to the Princeton Museum. Joshua was most excited about the squares in one of the sculptures. 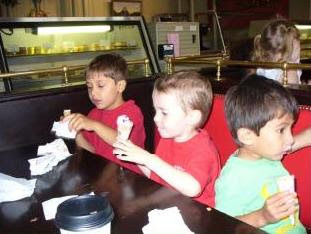 After the Museum, the kids headed to a local ice cream joint, Halo Pub. 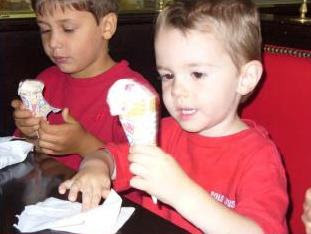 Joshua had strawberry ice cream. 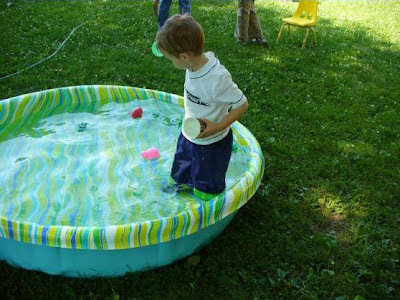 Now, doesn't that look like fun! I can hardly believe that we are moving in less than a week. On Saturday, we are having another big yard sale. This one should be even bigger than the last one. We have now sorted through about 90% of our apartment - all the closets, drawers, cupboards, bookshelves and more. This has been a hard purging process. My husband and I are so burned out with the weeks of this - we are at the point where everything left just needs to go into a box. Our bedroom has a huge stack of boxes in it - 32 boxes at last count. We have blitzed too many hours to count in the last few weeks. And we are almost done ... we have to be almost done, right? If you want to follow all the details of our crazy move, this will be the topic of my Blitz-It Friday's for the next several weeks. 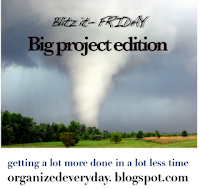 Stop by Organized Everyday for more projects that are being blitzed. 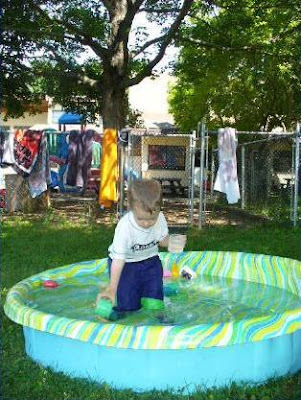 During the summer Joshua's preschool includes two days a week of water play. Joshua loves Tuesday's and Friday's. Here are some great pictures of their fun last week. 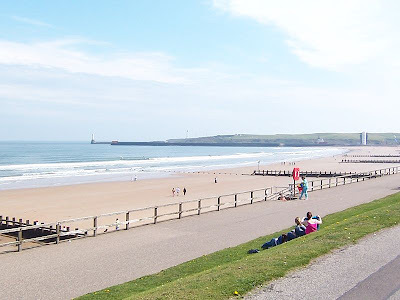 Check out this great view of Aberdeen Beach. It has been a little too long since our last update. There are only a few days left in the month of July we hen our lease here at PTS expires. And we are packing, cleaning and everything else required to get ready for our move. A week from now, Joshua, Abigail and I board a plane to Seattle for some great time with family. Darren and my dad have the fun job of moving all our stuff cross-country. They are driving a moving truck (towing the car) from New Jersey to Oregon, where we will store everything we own for the next three years (our move to Scotland will consist of only the suitcases we can carry on the plane). We will be visiting with family in the northwest for about six weeks, until mid-September. If anyone wants to get together while we're out there, please give let us know. There are so many details that have still not been settled. We are still looking for housing, and our visa applications won't be completed until we submit "Biometric data" in person on Friday. There are a million things to think about, but we are getting excited about this new adventure we are about to enter. Thank you for your prayers. We are excited to see everyone we can before we leave. You are also invited to come visit if you are ever in Scotland! What's Up With My Three-Year-Old? by Louise Bates Ames, Ph.D. and Frances L. Ilg, M.D. I was introduced to these books by Sarah at Hindsight – Thank you! 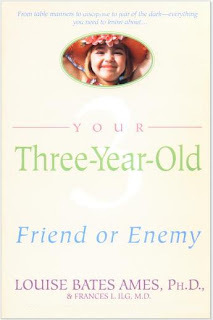 This is a great series of book about child development, from Your One-Year-Old through Your Ten- to Fourteen-Year-Old. This is not just another parenting book, and does not teach a particular philosophy or discipline style. Instead, the focus is on the characteristics of each age – how your child responds to other children; what general milestones are reached; why your child is behaving a particular way right now. The authors talk about alternating times of equilibrium and disequilibrium. Where three is an age of conformity, three-and-a-half is just the opposite. A three-year-old is confident and happy; a three-and-a-half-year-old child becomes insecure and anxious, but also determined and self-willed. It is normal for my son to experience fears and insecurities, even in things he had previously mastered. This weird stutter that has developed over the last few weeks, is normal and will fade over time. My son is learning to exert his will; I need to give him room to “win” in the daily struggle for control. This is the age to begin developing meaningful conversations, to lay the groundwork for great conversations later on. And especially that this phase will pass, both the bad and the good. Also included are recommendations on toys and books for three-year-old’s, and a list of suggested parenting books specific to this age. This book is only 150 pages and well worth the read! By the way, this is not a paid or solicited review; I just really liked this book. 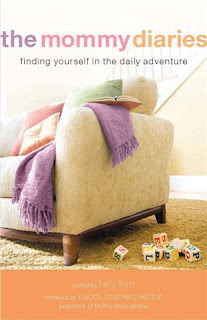 I am currently reading The Mommy Diaries: Finding yourself in the daily adventure. This straightforward book is a collection of stories from moms sharing what they have learned on this journey of motherhood. Check out my previous post about Identity. "Recognize this journey [of motherhood] as one that shapes and defines you, helps you scale new heights, and brings you closer to your amazing potential." In Mississippi Epiphany, Letitia Suk wrote the time she made a deliberate choice to stretch herself. "What that the kind of mom I want to be?" she asked herself. When the answer was "no" she decided to change. In this story, she chooses to say "yes" to her daughter's request for her to jump out of the boat for a swim. Every day I am bombarded with requests from my son to play some made-up game, dance some jig, do something totally silly. I tend to take myself too seriously, though, and don't say yes as often as I should (I am especially uncomfortable with physical humor). But now I see each day as an opportunity to grow in this area. Today I can say yes to a silly game or two, even if I feel completely ridiculous. 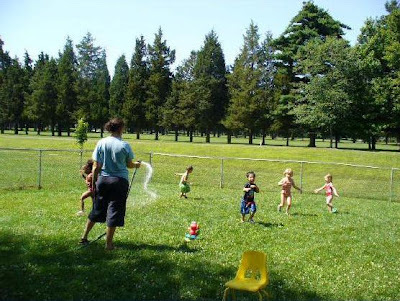 Along the same lines, Cathy Penshorn writes in Goodbye Toddler Mom about loosening boundaries and allowing her kids more freedom as they grow older - and to enjoy their more adventurous activities. Although my kids are still young, I have found myself stuck in the toddler mode, even though my son is older and ready to take bigger risks. I want to encourage my son's curiosity and allow him to explore in ways that I may have determined too dangerous for a smaller child. Of course, I am still watching for his safety, but I need to loosen the boundaries and allow a few bumps and bruises that may result from a beautiful learning experience. Where have you already experienced growth in motherhood? Is there an area of your life where you feel pulled to make a change? Two weeks left to empty our refrigerator, freezer and pantry. I don't know if we can use everything. But here is another week of planning from our cupboards. We are down under three weeks before the move. Some of our friends have commented that we are starting the packing very early. But it is slow going because we have to purge so heavily while packing, not to mention how much two little kids slow us down. Blitzed for a total of 5 hours. Cleared out 3 more bags of clothing, 2 boxes of kitchen appliances and dishes, 1 box of random bedroom stuff, and 2 bags of garbage / recycling. Cleared out / packed our bed stands and started on the master closet. Moved all the boxes into the corner of our bedroom to clear the living room of the feeling of clutter. This straightforward book, published by MOPS (Mothers of Preschoolers), is a collection of stories from several moms sharing the lessons they have learned in this journey of motherhood. It is a quick, casual read, but has the power to challenge and encourage. There are six sections in this book - Identity, Growth, Relationships, Help, Perspective, and Hope. I have only gotten through the first two sections, but wanted to share a few things that have inspired me. Elisabeth Selzer wrote an essay called Control Release. She writes, "My need for control was clouding my enjoyment of one of the most precious times in my child's life." This statement rings so true in my own life. I have found myself spending too much energy trying to retain my control over my three-year-old son and my one-year-old daughter. This leads to constant struggle of the wills that are normally not worth the fight. I am learning the truth of needing to choose my battles carefully. My children need to learn and grow with the freedom to explore their ability to make decisions and exert their will. My job is not to control them, but to guide them and teach them how to make the best choices and to deal with the consequences. In this same section on identity, Jane Rubietta shares a breaking point for her in the essay The High Chair Day. One rare morning where the kids were sleeping in and Jane was trying to spend a few minutes in prayer, she lost her temper at her husband over the smallest request. At that point she realized her loss of her own identity, and was drained of all her emotional and spiritual resources. Following this, she writes that "... with vigilance I guarded each morning for my soul." As my husband’s final semester of school wrapped up this year, I came to discover that I, too, have lost my emotional and spiritual reserves. It was a hard year for all of us, and I have been in survival mode for several months. Now that things are a little slower (though only for a few weeks), I need to learn from Jane’s example, and carefully guard my time in prayer and meditation. To be the mother and wife I want to be, I must preserve my own identity and guard my spiritual life. I cannot afford to neglect this discipline to service the immediate needs. In addition to taking additional time in prayer, I have also begun meditating on the Psalms. I wrote a more about it in this post. What activities or disciplines have you established in your life to preserve your identity in the midst of motherhood? "Here is what you must do - and don't put it off any longer: Get down on your knees before God Almighty .. and if you are pure and live with integrity, he will surely rise up and restore your happy home." Scripture has much to say about seeking the Lord. But life has become so busy lately that I have let my "seeking" slip to a lower priority. And, sadly, it is not long before I start to lose the desire to seek. It is a vicious, downward cycle. Once again, I hear his voice calling me back - back to his presence, back to the waters, back to the only source of life. This week I have begun meditating on the Psalms again. Reading David's hunger and thirst - pondering his worship and praise - begins to stir my heart to a place of thirst and of worship. I cry to you again, in my unfaithfulness, trusting in your mercy, falling on your faithfulness, knowing you are not far from me. Stir my heart again, to hunger and thirst for you. Fill me anew with a reciprocal love for you. Teach me afresh that only you bring life, healing and rest. Let my desire to know you motivate my every action, thought and word. Help me to seek you first, and trust that you will guide me in all the other things in life. "Do you want more food?" I asked Abigail. She smiled and replied, "Maybe." For the next four weeks, we are focusing all our energy into sorting, purging, packing and moving. This week was a great start; now we just need to keep the momentum going. Blitzed for a total of six hours (in one hour increments). Packed 15 boxes, including books, random kid's stuff and kitchen stuff. Cleared out three large bags of clothing, two boxes of toys, a box of books, and a few miscellaneous items. Completely packed / cleared out the top of the kid's closet. Started sorting the file cabinet - cleared out a HUGE stack of shredding.